Waterfront Pavilion Hotel Manila is inviting everyone to experience a truly Filipino Christmas by staying at their premier hotel located along U.N. Avenue in Ermita, Manila. Experience a mix of history and modernity coupled with a mix of the best qualities when it comes to leisure and business. For overnight stay this season or staycation enjoy a welcome Puto bungbong and Bibingka paired with either hot cocoa or brewed coffee plus get a Limited edition post card. Their rates are highly competitive and reasonable as well. 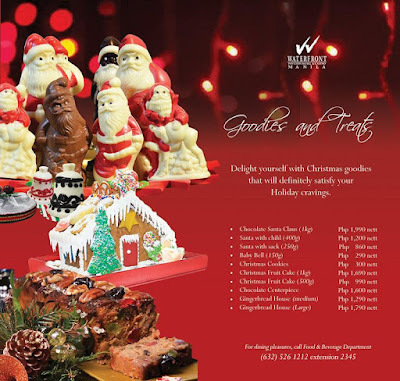 If you are looking for Christmas goodies then check out the Waterfront Pavillion Hotel and Casino Food and Beverage Department as they offer goodies to satisfy your holiday cravings. Goodies among others includes cookies, cakes and even a gingerbread house. Check out the photo below for a full list. Well, I know you will be asking if there is a staycation promo this Christmas for Waterfront Pavillion Hotel and Casino Manila. 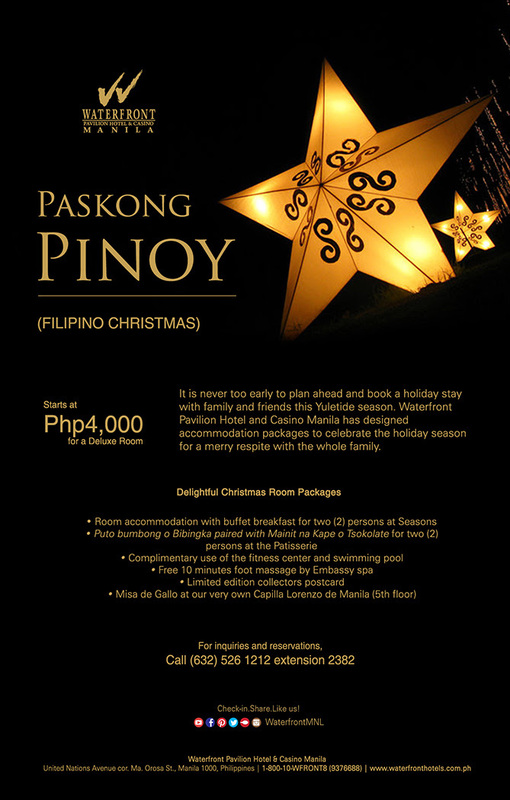 Well, there is and you get to enjoy Paskong Pinoy and experience hos it is like to have a truly Filipino Christmas. They will be having a Misa de Galo at Capilla San Lorenzo de Manila to those who wouldn't want to miss their ritual midnight church visits. All you have to do is pay P4,000 for a deluxe room and you get tons of freebies and treats which includes a free buffet breakfast for 2 at Seasons. Truly Christmas is more fun in the Philippines. For more details you can visit their website at www.waterfrontpavilionmanila.com.